With MOTU Volta, any hardware device with a control voltage (CV) input can be placed under precise digital control from your favorite audio workstation software. This state-of-the-art virtual instrument plug-in lets you play and automate modulars, analog synthseven effects processors. To use Volta, simply instantiate it as an instrument plug-in in your host software. You then trigger Volta with MIDI notes and a variety of other control sources, and Volta outputs corresponding control voltage (CV) signals to the audio outputs of a DC-coupled audio interface. The resulting CV signals are routed to the CV inputs of your external hardware. Audio output is routed back to Volta. 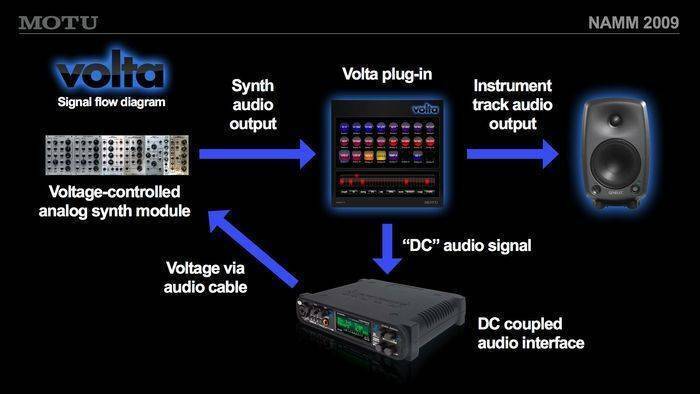 The signal path for Volta plug-in is a simple loop: a control voltage signal goes out to the external hardware. Pitch information comes back in, through Volta, as a normal digital audio stream that feeds into your host audio software mixing environment. From there, you can mix, process, and master Volta's audio output just like any other virtual instrument. MOTU Volta is easy to use but offers plenty of advanced programming features. The upper portion of the Volta window displays 24 output "slots", which represent the audio outputs on a connected audio interface. Simply drag any control source onto the desired output slot. Click the source to view its settings at the bottom of the window. Volta provides seven types of control sources that perform a variety of different functions. A single instance of Volta has 24 slots of output in which any combination of control sources can be applied. You can open as many instances of Volta active as your hardware allows. For example, a MOTU PCI-424 system with four 24 I/O audio interfaces provides 96 DC-coupled analog TRS outputs which can serve as CV outputs. You can even mount the rack brackets on the rear panel of each 24 I/O interface to mount it facing forward and use it just like a patch bay. A Volta Voice turns MIDI notes into voltages to control the pitch of your oscillators. A voice has a set of optional functions that appear as additional outputs. Usually, a voice needs an additional signal to gate the output of the oscillator. Volta produces up to four envelopes for controlling VCAs, filters, or other modules. If you'd prefer to use hardware envelopes, these can be turned into gates or triggers. You can also add initial and release velocity and LFO for each Voice. Polyphony with Volta is also as simple as dragging on as many voices as you need. The MIDI source receives MIDI controller data and directly transforms it into a control voltage signal. This allows you to use MIDI controllers like aftertouch or your mod wheel. The optional smoothing parameter can be used to smooth out the stair stepping associated with 8-bit MIDI controllers. The ramp source routes the high-resolution automation data from your DAW to control voltages. As soon as you drop the ramp source into a Volta output slot, it publishes as an audio automation data source for the Volta instrument track. Insert or record automation ramp data using all of the powerful automation tools in your host DAW to then control your outboard gear. Finally, intricate time-line based automation can be used to sculpt your compositions over time. Volta's LFOs provide the standard sine, triangle, and square wave shapes, but each with adjustable symmetry. You can set the LFO period in real-world units, or sync the LFO to your project tempo. A single LFO cycle can stretch over 16 bars for delicately evolving compositions. In addition, you have three random voltage generators, including sample and hold, sample and ramp, and random walk for all sorts of interesting smoothed and stepped CV functions. Volta's Trigger Sequencer can be used to fire off envelopes, step external sequencers, reset LFOsanywhere you'd need a trigger signal. You have up to 32 steps, two modes (forward and pendulum), adjustable trigger duration, and swing. The Step Sequencer provides an easy way to generate stepped voltage sequences in sync with your project. Like the Trigger Sequencer, you have the same swing, mode, and length options, but the Step Sequencer can be calibrated like the pitch CV outputs and quantize the result to the nearest semitone. The clock output allows you to clock external sequencers, hardware, or drum machines to a user-selectable PPQ. Since you can have multiple clock modules running simultaneously, you can synchronize multiple external devices from a single instance of Volta. MOTU Volta's unique oscillator calibration feature listens to the output of your oscillators and calibrates pitch tracking to ensure precise tuning. It displays at a glance how many octaves of pitch tracking you're able to obtain with your oscillator/interface combination. In addition to providing perfect tracking, when you hit a C3 on your keyboard, you get a C3 out of your oscillator. With the Volta plug-in, you can use Hz/V or V/oct tuning standards. This setting is per oscillator output, so you can seamlessly integrate Hz/V and V/oct gear as a single instrument. Once your calibration is complete, Volta can be set to auto calibrate. Oscillator drift is a thing of the past. 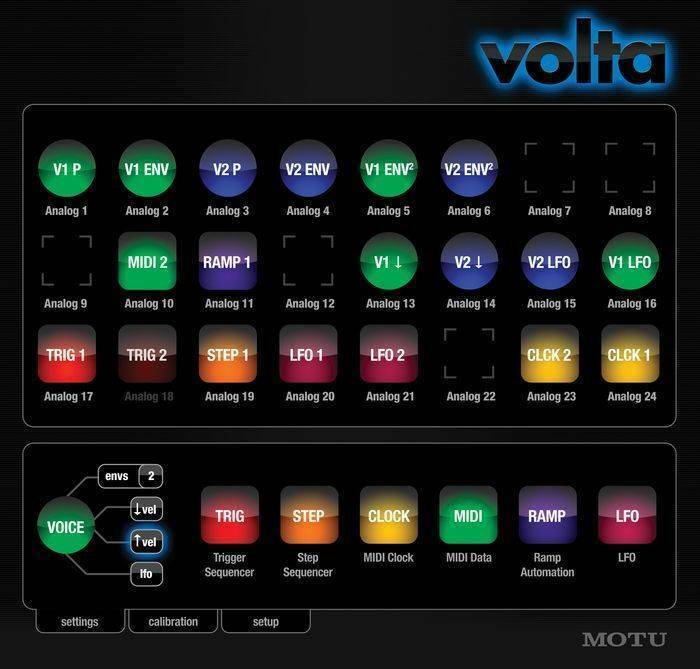 Volta can control any instrument with a control voltage (CV) input. Maximum output voltage varies from interface to interface. Therefore, accurate pitch tracking with Volta requires calibration. Volta operates just like a standard virtual instrument plug-in within your music production software. You can return the audio output of your external hardware instrument directly back into Volta, which then outputs the audio signal as standard virtual instrument output into your host software's mixing environment, as illustrated in the signal path diagram. This delivers all the benefits of virtual instruments inside your DAW, allowing you to freeze tracks, apply host-based audio effects and transform MIDI data with functions like arpeggiators. 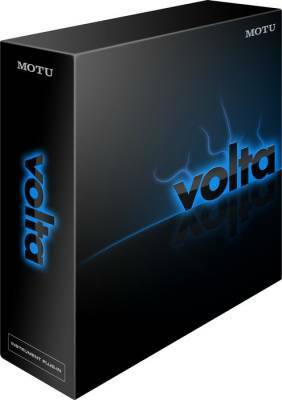 When used with DAWs such as Digital Performer that support pre-buffered sample-accurate MIDI playback, MOTU Volta can achieve sample accurate timing of external hardware.